The beautiful Monte Carlo 6 is such a treat to outfit! 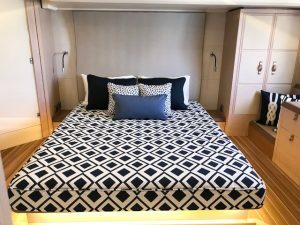 Three well planned staterooms are extremely comfortable for quick get aways or long trips. 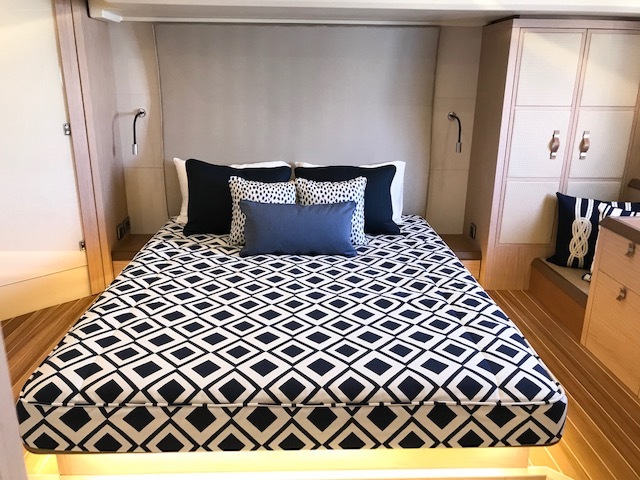 The lower deck features a full-beam master stateroom located on the yacht’s lateral and longitudinal centerline, a position that minimizes the effects of boat motions. There is storage throughout the stateroom and headroom. To port is a bureau with seating to both sides, directly underneath the large hull side window. Hanging lockers are to both ends.To the starboard side, a vanity sink is just beneath the large window. The master head is split to both sides of this sink with a water closet being forward, and the walk in shower being aft. This is an excellent arrangement, allowing privacy while letting two people get ready for a night on the town at the same time. Forward, the VIP stateroom is tucked into the bow. 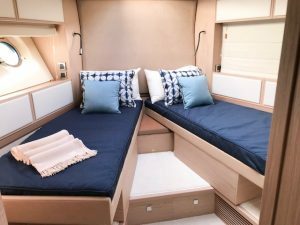 The berth can be used as a single queen-size, or opened in scissor-like fashion to create twin berths. This stateroom has the benefit of offering the most natural light, thanks to the massive overhead skylights along with the opening portlights to both sides. The head is located to the port hand side, along the hull, and it is surprising in its length. The large walk-in shower is to the far end. 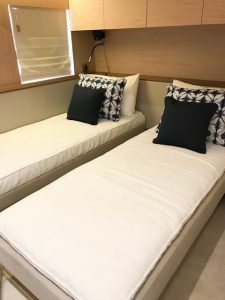 The guest stateroom is in the center of the boat with twin berths. These can easily be slid together to form a queen-sized berth. We took inspiration from the beautiful hull color and stuck with different hues of blue throughout the interior. 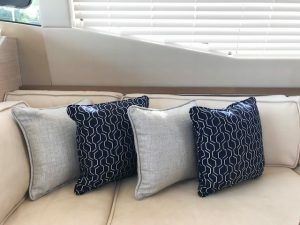 We used various Sunbrella fabrics that look fantastic and also wear beautifully. We have all patterns on file for the Monte Carlo Yachts MC4, MC5 and MC6. Give us a call and we can help make your stateroom a STATEMENT room!